Front-load washers, like the Whirlpool Duet washers, have some advantages over the top load washers. They are commercial grade washers and use much less sap and water to clean your clothes. Also, they have no agitator so there is room for larger items like comforters. This is a very nice front-load washer with many options. 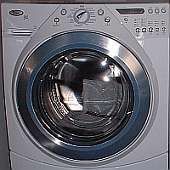 Because of its size, it is able to wash the equivalent of two to three loads of a top-load washer at once. Each load saves water and energy, cutting down on water and sewer bills, soap, gas and electric bills, and your precious time. The unit is heavy, but the matching dryer can be stacked to save space. The stainless steel tub is a nice feature so the tub doesn't rust and leave deposits on your clothes. Because it is a commercial unit, it is built to last longer than a standard top-load unit. This is a great washer to own if you wash a lot of clothes. Large stainless steel tub (3.8 cu. ft.) that will wash 16 pairs of jeans at once. No agitator means plenty of room for things like comforters and bedspreads. Uses 64% less water and 61% less energy than the average top-load washer. Commercial washer that is built to last and is Energy Star qualified. Spins out at 1,200 RPM to remove more water from clothing before you place them in the dryer. The Whirlpool Duet is large and heavy. This unit costs considerably more than a standard top-load unit. Controls are susceptible to voltage spikes. Large stainless steel tub (3.8 cu.ft.). Uses 64% less water and can wash up to 16 pairs of jeans at once! Uses 61% less energy than a traditional top-load washer. The Whirlpool Duet washer is Energy Star qualified. Spins out at 1,200 RPM which leaves clothes much drier before they ever go into the dryer. These front-load washers are very quiet when they are washing. A safety lock mechanism locks when the washers is running to eliminate a child from getting into the washer when running. This washer has no agitator so there is more room inside than a top-load washer. The dryer can be stacked on top of this washer with an option stack kit. I actually own a Whirlpool Duet dryer and love it. The washer isn't far behind, once the top-load washer gives up. I love the idea that I can wash one load of clothes a couple times a week rather than six or seven. Saving water is good for the planet and cutting my gas and electric bill would be great! I love the idea that I can wash bedspreads and comforters at home and not have to take them to the laundromat. If you've ever tried to wash them in a top-load washer, you know how they are soapy-smelling on top and not on the bottom. I'm not sure I've ever gotten the thing rinsed out properly. With its pull-out automatic soap, bleach, fabric softener, and pre-wash dispenser, once you fill them, the machine feeds them in the washer drum at just the right time. I will own one of these washers soon.